Manhattan District Attorney Cyrus R. Vance, Jr., today announced the sentencing of CRAIG ROTHFELD, 44, MICHAEL ROMANO, 43, and GREGORY MALESKI, 41, for defrauding investors of millions of dollars through a scheme involving WJB Capital Group, Inc. (“WJB”), a Wall Street securities broker-dealer that is no longer operational. ROTHFELD and ROMANO were each sentenced to 1 ½-to-4 ½ years in state prison, and MALESKI was sentenced to five years’ probation and 250 hours of community service. The defendants previously pleaded guilty in New York State Supreme Court to various charges including Grand Larceny in the First Degree, Falsifying Business Records in the First Degree, Scheme to Defraud in the First Degree, Securities Fraud, and Tax Crimes. According to the defendants’ guilty pleas and documents filed in court, between 2008 and 2012, the defendants defrauded more than a dozen investors and stole approximately $11 million from victims who were convinced, based on false representations and promises, to invest with WJB. Of the $11 million invested with WJB by the defendants’ victims, ROTHFELD and ROMANO embezzled approximately $7 million for personal uses. At the time, ROTHFELD was the company’s Chief Executive Officer, ROMANO was WJB’s majority owner, and MALESKI was the Chief Financial Officer. The defendants falsely informed their victims, many of whom were WJB employees themselves or close friends and family members of the defendants, that their money would be used for legitimate company purposes. In some cases, victims were told that their investment would improve WJB’s financial position, and in other cases, victims were not advised of the company’s precarious financial position at all. However, instead of using the funds for the promised purposes, ROTHFELD and ROMANO withdrew significant sums of victims’ money from WJB’s bank accounts for personal uses. For instance, ROTHFELD used the money to pay for home improvements on his Manhattan co-op and home in the Hamptons; ROMANO used the money to pay the mortgage on his home, and to cover various other personal expenses, including luxury cars and fees incurred at nightclubs, hotels, and country clubs. Additionally, ROTHFELD and ROMANO used funds from WJB’s bank accounts, which contained money invested by the defendants’ victims, to pay for personal charges made while using WJB’s company credit cards. As an additional part of the scheme, ROTHFELD and MALESKI filed false reports with the Financial Industry Regulatory Authority (“FINRA”) containing substantial misstatements of WJB’s net capital position in order to remain in business while luring new victims into the scheme. Furthermore, ROTHFELD and ROMANO each filed false New York State personal income tax returns underreporting their respective incomes by hundreds of thousands of dollars. In January 2012, WJB closed for business and terminated all of its employees in response to a FINRA determination preventing WJB from continuing operations based on the company’s filing of official reports containing significant misstatements regarding net capital. In May 2012, WJB subsequently filed for federal bankruptcy protection. FINRA also permanently barred ROTHFELD from acting within the securities industry and barred MALESKI from managing or supervising employees of broker-dealer firms. Assistant District Attorney Cory E. Jacobs handled the prosecution of the case, under the supervision of Assistant District Attorney Christopher R. Conroy, Chief of the Major Economic Crimes Bureau, and Executive Assistant District Attorney David M. Szuchman, Chief of the Investigation Division. Senior Investigative Counsel Vimi Bhatia provided additional assistance with the investigation. The following individuals also provided valuable assistance with the case: Investigator Biagio Rosano and former Investigator John Thorpe of Forensic Accounting and Financial Investigations; Supervising Rackets Investigator Gregory Dunlavey and Deputy Chief Investigator Santiago Batista of the Investigation Bureau; and Investigative Analyst Morris Breitbart, former Investigative Analyst Trevor Chenoweth, former Assistant District Attorney and Deputy Chief Judith Weinstock, and former Assistant District Attorney and Chief Polly Greenberg, all of the Major Economic Crimes Bureau. 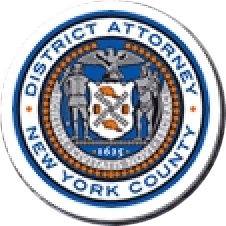 District Attorney Vance also thanked FINRA for its cooperation and assistance with the investigation, as well as the New York State Department of Taxation and Finance Tax, and in particular, Auditor Mukaila Rabiu of the Criminal Investigations Division.